The American Pale Ale is deep golden to copper in color. Characterized by fruity, floral and citrus-like American-variety hops that produce medium to medium-high hop bitterness, flavor, and aroma. Note that our version of this style of this beer has certain floral, fruity, citrus-like, piney, resinous flavors. This classic ale has a medium body and low to medium maltiness and a touch of caramel character. We brew our American-Style India Pale Ales to have medium-high to intense hop bitterness, flavor and aroma with medium-high alcohol content. It is further characterized by floral, fruity, citrus-like, piney, resinous, or sulfur-like American-variety hop character. The use of water with high mineral content results in this crisp, dry beer. With a pale gold to deep copper-color it has a full, flowery hop aroma and a strong hop flavor (in addition to the perception of hop bitterness). This IPA possesses medium maltiness which contributes to a medium body and fruity-ester flavors and aromas are moderate to very strong. Chill and/or hop haze is evident on very fresh examples. allowable at cold temperatures. served with the yeast in the bottle, and are cloudy when served. The aroma and flavor of our German Hefeweizen with yeast is decidedly fruity and phenolic (spicy). The phenolic characteristics are often described as clove-, nutmeg-like, mildly smoke-like or even vanilla-like. Banana-like esters are present at low levels. This beers is made with at least 50 percent malted wheat, and the hop bitterness is quite low. Hop flavor and aroma are absent allowing the spiciness to shine through. Our hefeweizen is dry and brightly carbonated with a full body. The color is very pale. Because yeast is present, this beer will have yeast flavor and a characteristically fuller mouthfeel and will be appropriately very cloudy. Tripels are often characterized by a complex, sometimes mild spicy character and ours is no different. 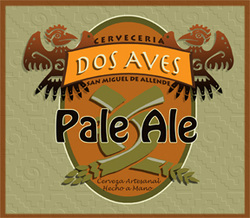 With this beer you will taste clove-like flavor and aroma at low levels. Also evident are yeast-generated fruity esters, including banana. This pale/light-colored ale has a sweet light finish. With a medium body there is an equalizing hop/malt balance and a perception of low to medium hop bitterness. There is a perceived alcohol presence. Chill haze is evident at low serving temperatures and this beer may exhibit slight yeast haze.